Marshall Football wraps season with big win, creating expectations for 2014. “Bottom line is someone telling you you’re going to be a top 25 team is not what gets you there, it’s the work and everything that goes along with it, but we can’t become complacent,” Holliday said. The 10 win season was the first time since 2002 that a Marshall team finished with double-digit victories. It also marked the first Conference USA East Division crown for the school and trip to the Conference USA championship game, where they would lose to Rice. In the final USA Today Coaches Poll the Herd finished 29th. Holliday said three things will determine how successful the team can be next year. The 5 win improvement from 2012 to 2013 has many wondering what could happen in 2014 with a schedule that looks favorable for an experienced team like the Herd to make a serious run. With non-conference matchups with Ohio University, Miami Ohio and Kent State University, fans are looking forward to the season. Holliday said when he looks at his team this offseason he sees a vastly different group than last offseason. “I just thought to myself we’re so much further ahead than this time last year, I looked out there a year ago and I didn’t see what I see right now which is a good thing and it’s going to be important,” Holliday said..
Holliday hopes that the success of this past season mixed with high expectations have an impact as he and his coaches hit the road to finish up recruiting for next year before the national signing period begins February 5th. That’s when athletes can sign on the dotted line committing themselves to a college football program. “One of the things about Marshall University Football is it has great tradition, you can walk into almost every home out there they can tell you about the number of wins they had in the 90’s and the 2000’s and the Randy Moss’ and Chad’s and Byron’s and on and on and we’re getting back to that,” Holliday said. The Military Bowl was Marshall’s second bowl win in three seasons. The Herd beat F FIU in the 2011 Beef O’Brady’s Bowl. Marshall Football will finish the 2013 season with a trip to the Military Bowl in Annapolis, Maryland against the University of Maryland on December 27th. The trip to the Military Bowl marks Marshall’s 11th bowl trip in the school’s history and the first under Head Coach Doc Holliday. Following a 9-3 regular season the Thundering Herd was knocked off in the Conference USA Championship game at Rice 41-24. Holliday said bowl trips are much more fun when you win. 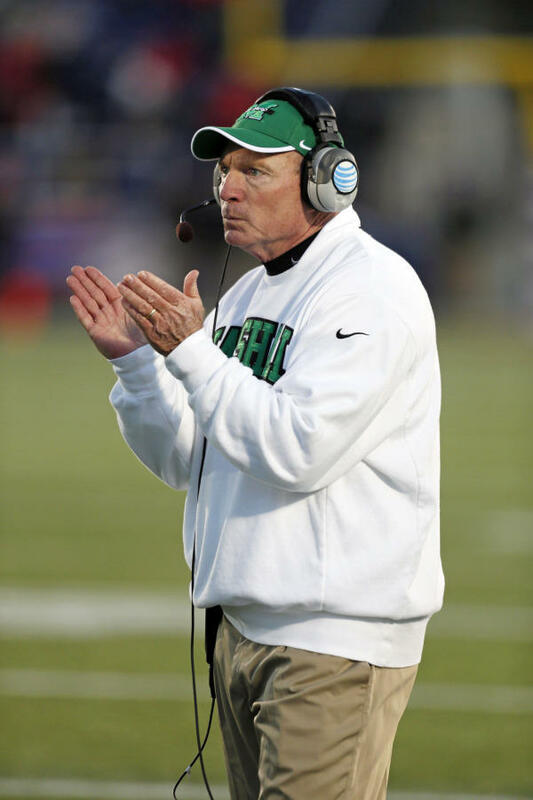 For the first time since joining Conference USA in 2005 Marshall Football will compete for a conference championship.